Similar to last year, each week, the Centers for Medicare and Medicaid Services (CMS) will release weekly Open Enrollment snapshots for the HealthCare.gov platform, which is used by the Federally-facilitated Marketplaces and State Partnership Marketplaces, as well as some State-based Marketplaces. These snapshots provide point-in-time estimates of weekly plan selections, call center activity and visits to HealthCare.gov or CuidadoDeSalud.gov. The final number of plan selections associated with enrollment activity to date could fluctuate as plan changes or cancellations occur, such as in response to life changes like starting a new job or getting married. In addition, the weekly snapshot only looks at new plan selections, active plan renewals and, starting at the end of December, auto-renewals and does not include the number of consumers who paid their premiums to effectuate their enrollment. Comparisons between this year and last year are difficult for a variety of reasons; including that the Thanksgiving holiday fell during the second week of last year’s Open Enrollment period. HHS will produce more detailed reports that look at plan selections across the Federally-facilitated Marketplace and State-based Marketplaces later in the Open Enrollment period. 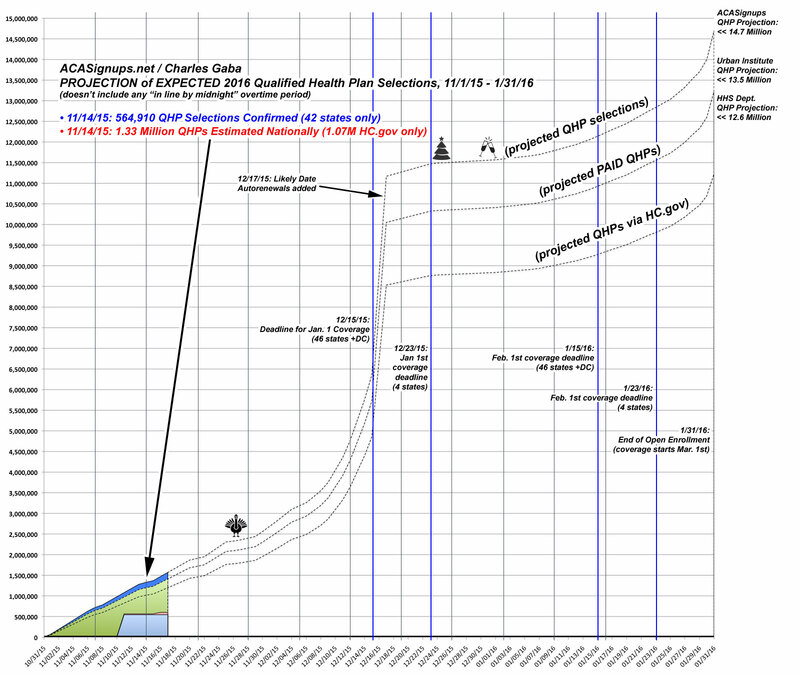 I originally projected 1.07 million QHPs via HealthCare.Gov by Nov. 14th back on the 12th, but then decided to be a bit more cautious later in the week, tamping the number back down a bit to 1.0 million on the nose. A reasonable measure of my accuracy would be right in between these, at 1.035 million. I actually suspect I've under estimated the additional state-based QHP tally, mainly because Rhode Island "front-loaded" their autorenewals (around 30K higher than I would've expected at this point) and because Colorado seems to be overperforming so far. As a result, I'm going back to assuming roughly 1.4 million QHPs nationally as of 11/14, as I noted back on 11/08. Other than that, not too much else to report here without the state-level numbers. The "Renewal" vs. "New" ratio is virtually the same as last week (2/3 renewals, 1/3 new), so nothing has changed there. OK, so what about this week (Week Three)? Well, it should actually be roughly the same story, likely dropping off slightly to around 500,000 even. If so, that would bring the HC.gov total up to around 1.58 million as of November 21st, or around 2.05 million nationally. The week after that is when I expect the first significant pattern change; things will likely drop off considerably for the Thanksgiving holiday weekend (especially Thursday and Friday, of course), possibly bringing the 4th week in at under 300,000 for HC.gov (1.88 million cumulatively), but I'll make a formal estimate after next week's figures come in.